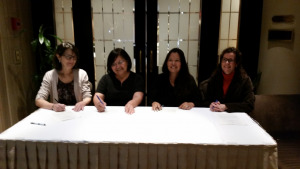 A first of its kind signing has occurred between the Lhoosk’uz Dene Nation, Ulkatcho First Nation, the Canadian Environmental Assessment Agency, and the BC Environmental Assessment Office. Today we have entered into an agreement that allows us to collaborate with the Federal and Provincial governments on New Gold Inc. Blackwater Gold project environmental assessment. The agreement moves us from merely being consulted and into a position where we are collaborating and inserting our voice into the process. Not only do we get to hold the pen during the drafting of Part C, but we’re also providing considerable input on the content of Part C.